Inadvertent inhalation of toxic gases during firefighting and overhaul is a significant cause of immediate and long-term injuries and deaths among firefighters nationwide. To solve this deadly problem, researchers in WPI's Electrical and Computer Engineering Department and Fire Protection Engineering Department – with funding support from FEMA -- are collaborating on the development of a wearable sensor that can warn firefighters of the presence of carbon monoxide in and adjacent to the fire ground. Firefighters typically remove their air masks after leaving a burning building, unaware that toxin levels can still be high in presumably safe areas, including outside the structure. The new toxic gas sensor would provide each firefighter with real-time information about exposure to Immediately Dangerous to Life or Health (IDLH) and to lower level, but dangerous, Chronic Exposure Danger (CED) conditions. The sensors will overcome problems with existing commercial monitors that make them unsuitable for use at fire scenes (they are not designed for high toxin levels; heat and humidity cause failures and prolonged service outages; and constant alarm signals prompt users to turn them off). We believe that this sensor will lengthen the lives of firefighters by greatly reducing exposure to these lethal gases and thus circumventing their long-term degenerative effects. 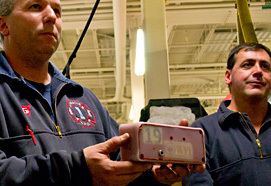 Having undergone extensive tests in WPI's Fire Protection Engineering Laboratory and at the Massachusetts Firefighting Academy, the sensor was recently tested in the field by more than 50 firefighters with the Worcester Fire Department during actual incidents. In addition to assessing the sensor’s usability, researchers also plan to study the influence of improved situational awareness about asphyxiants on firefighter decisions.